A pilot has been suspended after turning up allegedly drunk for work before trying to fly a plane carrying more than 150 passengers. 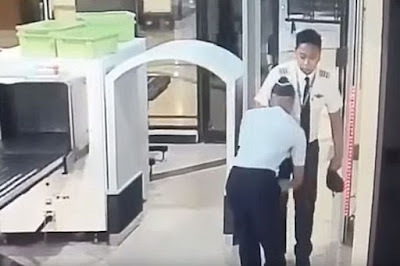 CCTV footage of the moment the Indonesian pilot tried to pass through airport security acting intoxicated has emerged online. Press play to watch it below. The footage of the pilot, who has been reportedly been identified as Capt. 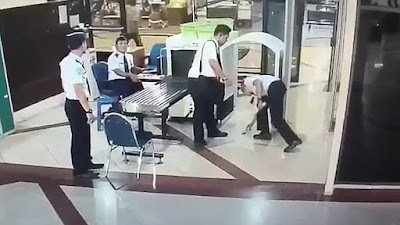 Tekad Purna, shows the man repeatedly dropping his things all over the floor and dramatically swaying as staff attempt to help him. As the man arrives at the checkpoint wearing dark sunglasses, he drops his hat on the floor. He then dumps his bag on the conveyor belt before walking through the body scanner. As he goes to collect his bag, swaying as he does so, it tips upside down and his belongings fall on the floor. As the security staff try and help by gathering together his things, the man also drops his sunglasses, which appear to break. After staff hand him his glasses the man walks off holding them in his mouth. Reports suggest the pilot made it all the way to the cockpit of the CityLink plane, a budget Indonesian airline and subsidiary of national airline Garuda Indonesia, before his condition was noticed. The 154 passengers on the plane staged a walk out when the pilot made an incoherent announcement over the tannoy system, with nine of them cancelling their flights, according to the Transportation Ministry's report. The pilot was removed from the aircraft and replaced with another before the plane departed from Juanda International Airport in Surabaya, East Java, and flew to Soekarno Hatta International Airport in Jakarta. The pilot has since been suspended and will undergo a full medical test, although Citilink stated that the pilot's initial drug and alcohol tests came up negative, MirrorUK reports.